What is your favorite park? It is an impossible question… and one the kids get asked often. But, all the parks were established to preserve an incredible part of the country, and not just any place… but the highest! The deepest! The longest! The most! The best! There is something magical about all the parks. Something that transcends the efforts of getting there. We’ve now been to 27 National Parks; we’ve spent the night in a tent, hiked a few trails, gotten dirty, explored a wilderness, learned something new, and seen something amazing there. We’ve learned a lot about these parks, and we all have fond memories of each stop along our trips for unique and various reasons. So, how do you pick the very, very best? Your most favorite? How can you rank the dense wilderness of Sequoia against the vast sun-beaten grasslands of the Badlands? Can you even compare the alpine meadows of Glacier with the glow of an Arizona sunset on the walls of the Grand Canyon? Or choose a favorite between the Mammoth Hot Springs of Yellowstone or the Great Bat Caves of Carlsbad or the flowing Volcanoes of Hawaii? I don’t know that you can. We do each have a few favorites through. It’s like books. I don’t think I can pick my most favorite. But, I can pick my top three, hmm… or maybe I’d have to go with a top five. Either way, there are a handful of parks that I hold very near and dear to my heart, not just for their beauty, but for some of the experiences we’ve had there. Three of my most favorite are included in the Northwest Itinerary: Rainier, Olympic, and the Redwoods. So, although I can’t pick a favorite park, I think I can pick a favorite trip. Not only does the Northwest Itinerary include six incredible parks, but it also includes some other locations that make this itinerary special: the beautiful Lake Chelan, the pristine San Juan Islands, the culturally unique cities of Seattle and Portland, and the absolutely breathtaking Oregon coastline. Not to mention that in between stops, you are driving through some of the most magnificent and productive forests in the world. But every trip has its valley… even the Best One. I lost my wedding ring on this trip. It wasn’t a diamond or a family heirloom, thank goodness, but it was mine. It was a very simple, plain, white-gold band, the one I was married with, the one I’d been wearing all those years we struggled through the early part of my marriage, and through all the happy times we shared while watching our family grow. It was heartbreaking. I believe I lost it somewhere in our campground at Lake Chelan, and after hours and hours of looking for it, driving away was torture. But there’s more. That was also the summer that we were trying to keep a flailing business partnership afloat. I’m not sure if any of you have ever been through a business partnership “break-up,” but I think it may be as emotionally draining and devastating as divorce. You face some of the hardest issues among our personal relationships: the loss of loyalty, trust, and friendship. The stress level and phone calls were enough to make us all think about driving home early. I’m so glad we didn’t. There are always reasons not to go, not to plan, not to spend the money, or not to take the time. But, I’ve never yet felt that one of these trips wasn’t worth the effort or the sacrifice of being there, because this is the thing that is most important: the time with your family. Now it is three years later and when we look back, we don’t see the things that went wrong. We remember the great eagle that swooped over our dashboard while in the San Juan Islands. We remember how it felt to be standing under the powerful spray of Comet Falls after accomplishing a strenuous two mile hike up the foothills of Mt. Rainier to get there. We remember the first time we walked over the rim and gazed at Crater Lake. We remember our first Fourth of July in Bend, OR, a town we would come to call home. We remember the breathtaking views overlooking the Olympics Mountain range and the laughter of following the Twilight Trail in Forks. We remember that incredible Museum of Flight in Seattle. We remember the salt-water taffy in Seaside. 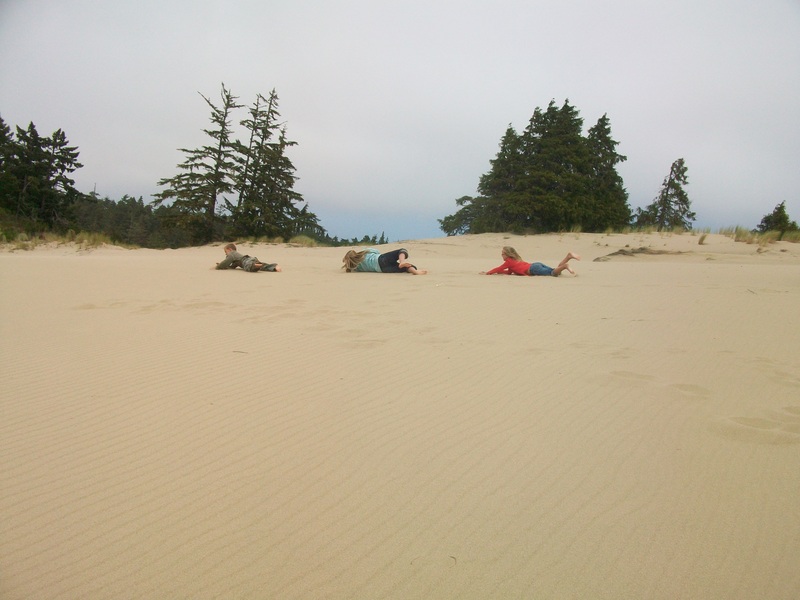 We remember throwing ourselves down the great sand dunes of the Oregon coast. We remember our last hike of the trip, walking through a dense fog in the middle of the Redwood forest. I guess the point I’m trying to make is that we all have valleys in life, just like every trip will have it’s valley. Don’t let that stop you from taking them! And more importantly, don’t let it stop you from finishing them. Our first business disintegrated that summer, and I lost my wedding ring. But, we just deal with the difficult times knowing that it’s only a low point, and that we’ll hike out of it soon enough, and onto our next mountain. My brilliant husband has built up a better company and I’ve inherited a beautiful heirloom ring from my Great Grandmother. And, now that I look back, I kind of like the thought of my plain gold band buried somewhere near the shores of Lake Chelan. Maybe someday, some imaginative child will dig it up out of the mud and play a little game called “The One Ring.” One can only hope. Let’s teach our children about the world they live in, about why the Earth looks the way it does, about why different plants grow where they do, and why different animals live where they live. Let’s teach them about how the forces of nature have created the lands and the seas, and teach them how life is shaped to its landscape. School will teach them the vocabulary and the process, but the opportunity for inspiration and passion to be ignited, the opportunity for the right teacher to meet the right student under the right circumstances is entirely left up to chance. Don’t leave this to chance. Let’s take it upon ourselves as parents to inspire passion for the world we live in. Let’s give them just a little knowledge while they are gazing in amazement at thunderous mountains and rich verdant valleys. Doing so will inspire the respect and wonder of nature within. I can’t express enough how easy it is; all you have to do is talk about it a little, and what a permanent, lasting impression that your passion for the world will have on them. Let’s get started! Remember from my Science Friday post that I really like to have a science theme for each vacation. I use it as a focus, like if they are going to learn just one thing on this trip, this is what it is going to be. Throughout the journey we continue to revisit the theme as we see examples of it. The Northwest (Itinerary #2) science theme is… Plate Tectonics! I’m not gonna lie, that seamed a little anticlimactic. Still, just wait until you learn how really cool it is! (Yes, I might be modeling super-uncool mom enthusiasm here.) I’ve also listed some more opportunities to point out unique ecosystems during the second half of the trip, using the vocabulary we discussed in the Science Friday post I prepared for Itinerary #1. I chose this theme because the first half of the trip involves travelling up the beautiful Cascade Mountain Range, a range of mountainous volcanoes that were created by shifting of the Earth’s plates. Our trip theme of plate tectonics gives us the opportunity to talk the kids about why the continents look the way they do and a whole lot of opportunities for them to see the evidence themselves. I do have a very colorful powerpoint posted on plate tectonics here on my old teacher website. However, allow me to give you a very brief explanation of the scientific theory for our purposes. Plate Tectonics explains the large scale movement and change of shape in Earth’s plates. The most superficial layer of the Earth is called the Lithosphere, and is composed of a very thin outer layer of mantle and the entire Earth’s crust. The lithosphere is not one single large piece, but is actually broken into about 15 different pieces that we call plates, which can move and float across the mantle underneath them. There are three types of boundaries between these plates and their movement gives texture to the surface of the Earth. First, boundaries can diverge, where two plates are actually moving away from each other, like in the Red Sea. Second, two plates can simply slide past each other as in the San Andreas Fault, which is called a transform boundary. Third, two plates can converge where two neighboring plates collide. If two continental plates collide, the edges will crumple and create folded mountain ranges, as in the Himalayan Mountains. If two oceanic plates collide, one plate will subduct under another and magma will rise to the surface forming Island arcs. Japan is an example of this. Finally, if an ocean plate collides with a continental plate it will create a subduction zone where the ocean plate sinks underneath the less dense continental plate, and volcanic mountains will form as magma rises to the surface through the continental crust. This last example is what formed the Cascade Mountain Range of the Pacific Northwest, which you will be hiking across throughout your Northwest Adventure! 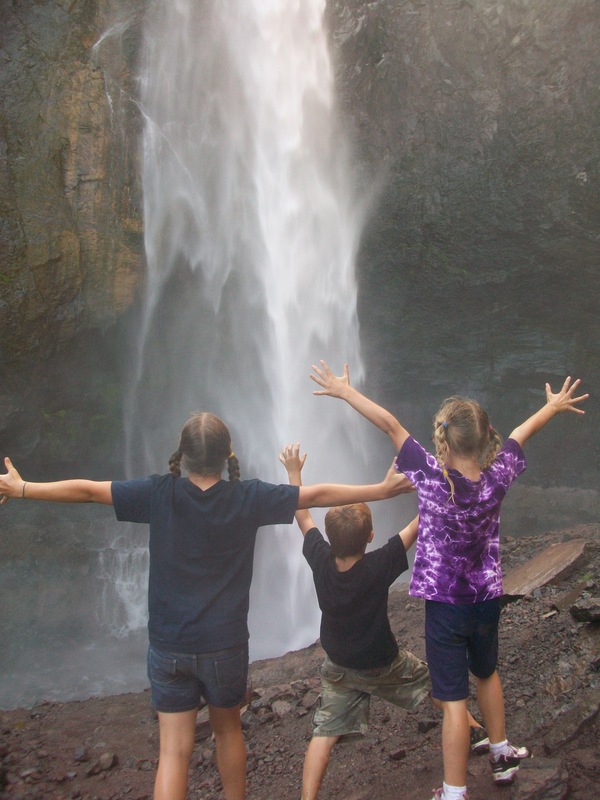 Below are listed ways to make the science accessible to your children as you explore the National Parks on the Northwest Itinerary. Good luck and have fun while you are learning! As the name implies, show the kids the volcanoes of Lassen! All four types of volcanoes found in the world are represented in Lassen – shield, composite, cinder cone, and plug dome. Although there have not been any recent volcanic eruptions, there are steam vents, boiling springs, and bubbling mudpots that are currently active and accessible to visitors. Check out the Lassen NPS science page for more info before you leave, and ask the rangers at the visitor center where you can go to explore each type! Make sure the kids feel the rocks! All the rocks in Lassen originated from volcanoes. 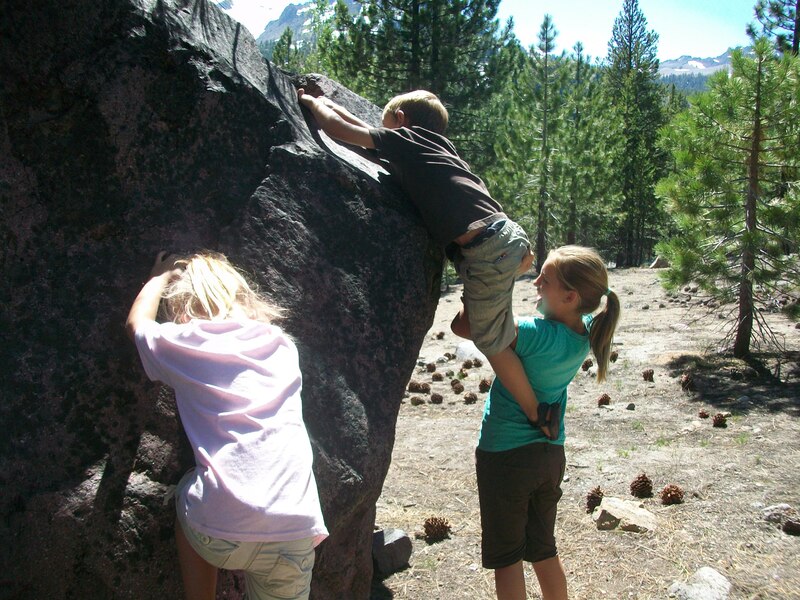 Have the kids try to identify the different examples of pumice, basalt, and other rocks as you hike around the park. Study different rock types at the visitor center before you head out! Many children think that Crater Lake was formed from a crater hitting the Earth, but of course it was not. The great Mt. Mazama was a volcano formed of succeeding eruptions that continued for over half a million years! The last eruption blew so much material out of the top that everything left behind settled into a deep, bowl-shaped depression called a caldera. Over the centuries this caldera filled with rain water and snow melt to form what is now the deepest lake in the United States, Crater Lake! While you are walking around the rim trail and gazing at the exquisite views, talk to the kids about how this lake is different from other lakes they’ve seen. Follow the paved pathway from the Rim Visitor Center to the Sinnott Memorial Overlook. I think this is the best exhibit in the park! Not only does it have an awesome kid-friendly video showing the growth of Mt. Mazama and the events that lead to the formation of Crater Lake, but it also has amazing exhibits on the Ring of Fire. The Ring of Fire is a horseshoe shaped outline of the Pacific Ocean where much of the worlds volcanic and earthquake activity occur as a result of the movement between tectonic plate boundaries. The volcanoes associated with the Cascade Mountain Range are a part of the Ring of Fire. 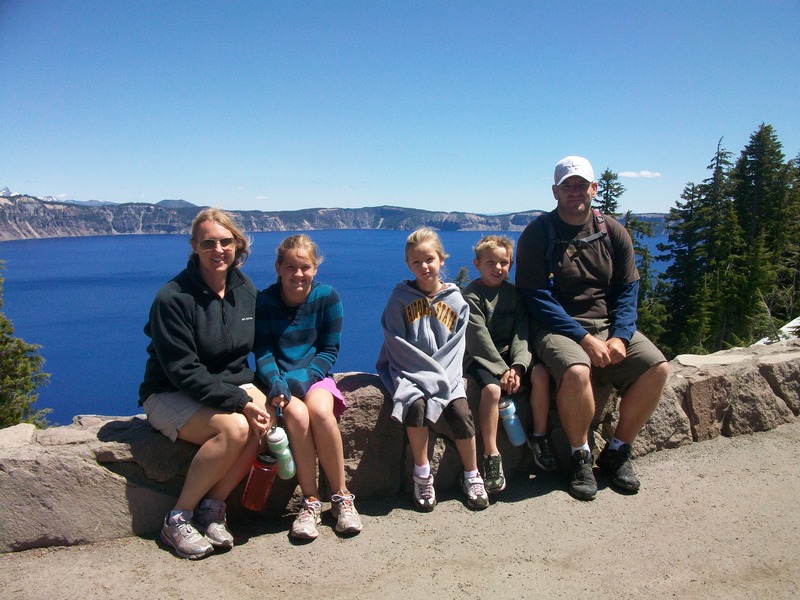 2010, Crater Lake National Park – Clemans Crew on the rim of Crater Lake. Mt. Rainier is the highest volcano in the Cascade Range and the 2nd most active, after Mt. St. Helens, experiencing about 20 small earthquakes a year. Use the information at the visitor centers to teach the kids about how we study volcano’s, specifically all the research on the seismic activity of Mt. Rainier. Have them look at the large relief map and brainstorm how they think the surrounding communities would be effected should the volcano explode in the future. There are 25 named glaciers on Mt. Rainier. It is the largest glacial system on a single mountain in the United States outside of Alaska. A glacier is a sheet of slowly moving rock and ice. They are formed when the snow built up in the winter doesn’t completely melt in the summer, and then gets compacted into ice as more snow is accumulated in the following seasons. Before you visit, have the kids watch this really excellent video that gives information on how and why scientists monitor the glaciers so closely. Almost all the hikes in Mt. Rainier give you breathtaking views of one of its many glaciers. The rivers formed on Mt. 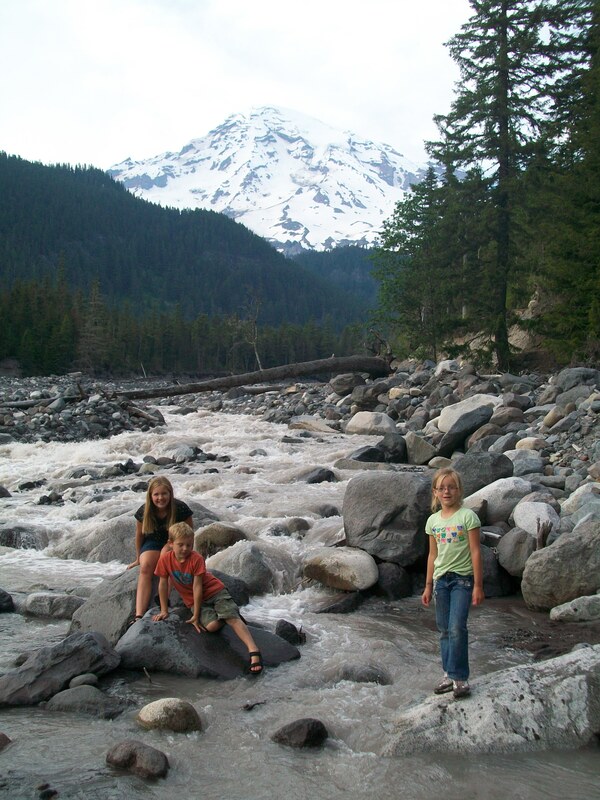 Rainier are shallow, wide, and full of all kinds of rocks and boulders to climb around on. This is because the rivers are formed from the runoff of melting glaciers. When the glaciers melt, they release huge amounts of rock that were trapped in the ice into the river beds, where it is gradually tumbled downstream. This gradual build-up of rock in the park’s riverbeds is called aggradation, and it causes the glacial riverbeds to be wide and rocky. While you are out hiking with the kids, ask them why these rivers look so different from other ones they’ve seen, and try to guide them towards some of these answers! 2010, Mt. Rainier National Park – Climbing around the aggradation. Though these mountains are not volcanic, the shape of them mountains is partly attributed to the movement of the many glaciers in the region. As the glaciers move, they slowly gouge out huge rifts in the land, and scrape along the rock carving the deep valleys. As you are standing at viewpoints around the park, have the kids try to identify some valleys that look like they have been carved out by a moving glacier. 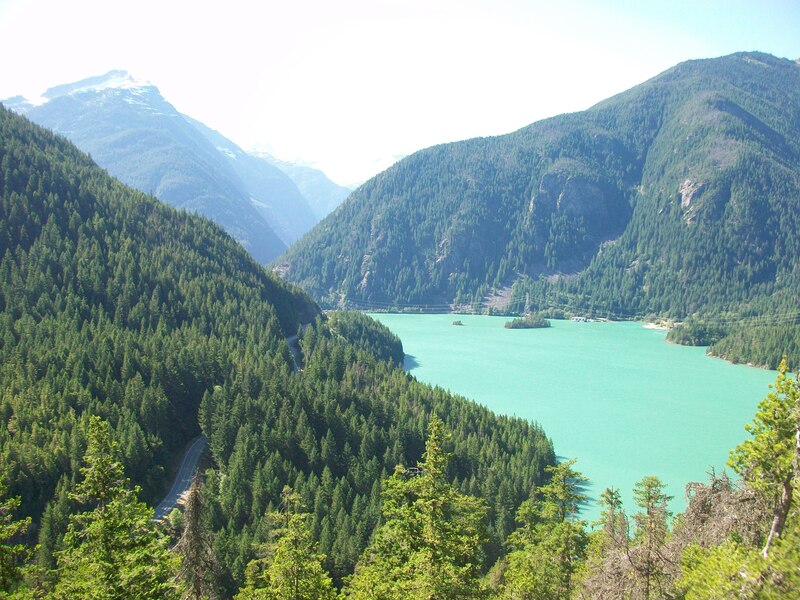 The North Cascades are home to tremendous biodiversity, a word that describes the variation of life within a region. Its ecosystems range from wetlands and marshes to high alpine meadows, housing a huge variety of habitats within. This page gives you a list of hikes to do within different life zones of the park. Make plans to take the kids to an old-growth forest or follow the Cascade Pass Trail to the Alpine ecosystems in the park. The landscape and diverse ecosystems at the Olympics makes it one of my favorite parks! 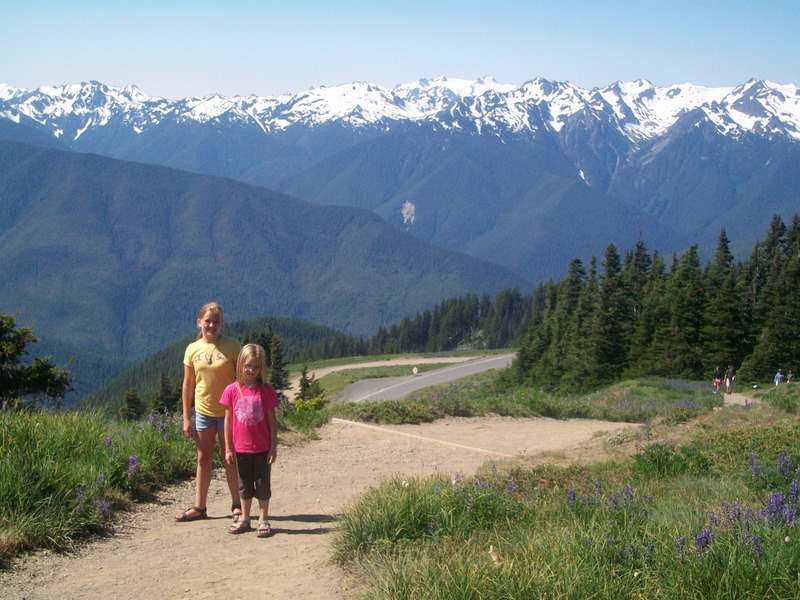 The benches and trails at Hurricane Ridge give you the highest and best views of the magnificent Olympics! See if you can spot Mt. Olympus! Below the glacial-topped peaks you’ll see scattered alpine meadows and lakes. Point out the treeline to the kids and explain why this divides the alpine meadows from the sub-alpine forests. Why can’t the trees grow at a higher elevation? What does having the trees there allow (and not-allow) to grow? Have the kids try to identify the living and nonliving factors that contribute to the different ecosystems found in the mountains. Another interesting thing to point out is that these mountains are also not volcanic in nature, but were born in the sea and uplifted and shaped over millions of years! The Olympics are home to some incredible forests! This page describes five different forest ecosystems within the Olympics. Research some species that are indicators of each forest type and while you are hiking around try to have the kids find those species of plants and identify what type of forest they are in! My favorite teaching experience at Olympic N.P. was at the Hoh Rainforest. 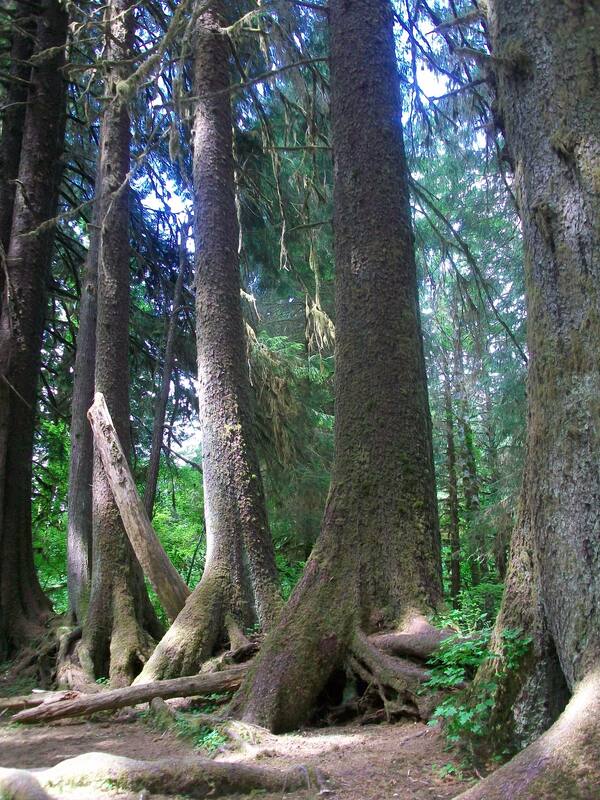 The Sitka Spruce is an indicator species for the Northwest temperate rainforest, which means that unless that tree is growing there, it cannot be identified as the rainforest. These large, majestic trees dominate the landscape, as do nurse logs. Nurse logs are found lying on the forest floor and as they decay they grow more trees where seeds have germinated on them. After the nurse logs rots away, you’ll see a colonnade, or a row of trees that sprouted together on the nurse log. The precious piece of wilderness along the Olympic coastline is full of coastal forests, rocky outlets, sea stacks, beaches, and tidepools stacked with life. In one tidepool you could see hundreds of animals! Let the kids walk around each of these different ecosystems along the coastline and get them thinking about the great biodiversity that is sheltered by this land. Have each of them stand in a different spot and without moving name or point to all the different species of life they can see at that moment. Be ready to be amazed! 2010, Olympic National Park – A colonnade in the Hoh Rainforest. The Redwoods provide a great opportunity to talk with the kids about the importance of conservation. Today, there is only about 4% left of old-growth redwood forest that used to cover two million acres in North America. Go to the visitor center and talk to the kids about the difference between human consumption and conservation. Ask them what they think is necessary consumption and ask them ways that they think we can protect what remains of this majestic forest. Since the trees are the highlight in this park, take the time to teach them a little about them! This is another great place to study populations. Ask the kids what factors they think contribute to the trees growing so tall (some reaching 360 ft!) or living so long (some live to 2000 years old!)? Their resistance to insect and fire damage are important ones, as well as their ability to use both sexual and asexual reproduction aid in their survival. They also live in a richly populated forest with complex soils, and the dense coastal fog that settles in the forest during the summer months provide water for survival. In order to relate the Redwoods back to our geology theme, remind the kids that this park is located about 100 miles from where three different tectonic plates are joined. The shifting and sliding between these plates creates more earthquakes in the this region of California than any other area of the United States. 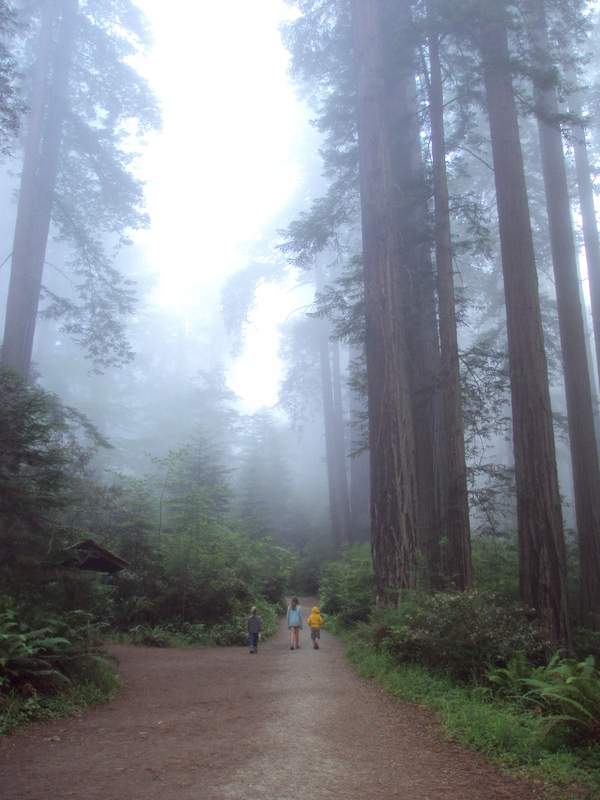 2010, Redwood National Park – The trees, the fog, the kids. Love. So, I realize this was a lot of science for one day but I wanted to get all the science stuff for Itinerary #2 posted at once! We are very excited to be leaving on our 5th annual summer road trip tomorrow! If I can find the time to blog while travelling then I will, otherwise I’ll report back at the end of August.